salad herbs, salt and pepper to taste. You will need your bento box, large and small pots, colander, and a frying pan. Let's start by marinating the meat. In a small pot boil 500ml of water with beef stock cube, then take it off. Add teriyaki sauce and let the marinate cool down for 1 minute. You can add extra spices that you like: garlic, garlic powder, pepper or finely chopped shallot or onion. Slice by slice, place each piece of beef in the warm marinade and make sure the meat is completely covered by it. Set aside on the counter until the next day's morning. Finely chop shallot, and grate the carrot. Set them aside. Slice tomato, cucumber and lettuce leaves for the salad part of your bento and arrange your bento container with the salad. You can sprinkle it sesame seeds, herbs or grated mozzarella cheese. Follow the instructions printed on your pasta container, but add some salt, garlic powder, and herbs to the water. The spices and herbs will add extra aroma and visual flair. Take each beef slice from the marinate and dry it with a paper towel. When all are dry, heat a heavy-bottomed pan with some cooking oil (1-2 teaspoons). Place all the meat on the pan and fry it until it's browned. You can pour 1 or 2 spoons of the marinate on the meat to give it extra flavor and moisture if it dries on the pan too much. When meat is cooked, set it aside on a plate and slice into 1/2 inch-wide strips. You can taste the meat and sprinkle with pepper if you like. Heat up the pan you fried meat on, and start frying shallot and carrot bits for 1 to 2 minutes, or until the shallot is glazed — you don't need to cook them through, only warm, to give some crunchiness to the pasta and extra flavor. Strain the pasta through a colander to remove the water, and place it on the pan with meat juices and vegetables. Start mixing everything on a medium heat to keep everything warm. Vegetables and pasta will absorb remaining oil on the pan, so pour up to 3 spoons of the beef marinate on the pan and reduce. This will make the flavor so much nicer and also will prevent burning or drying the pasta. 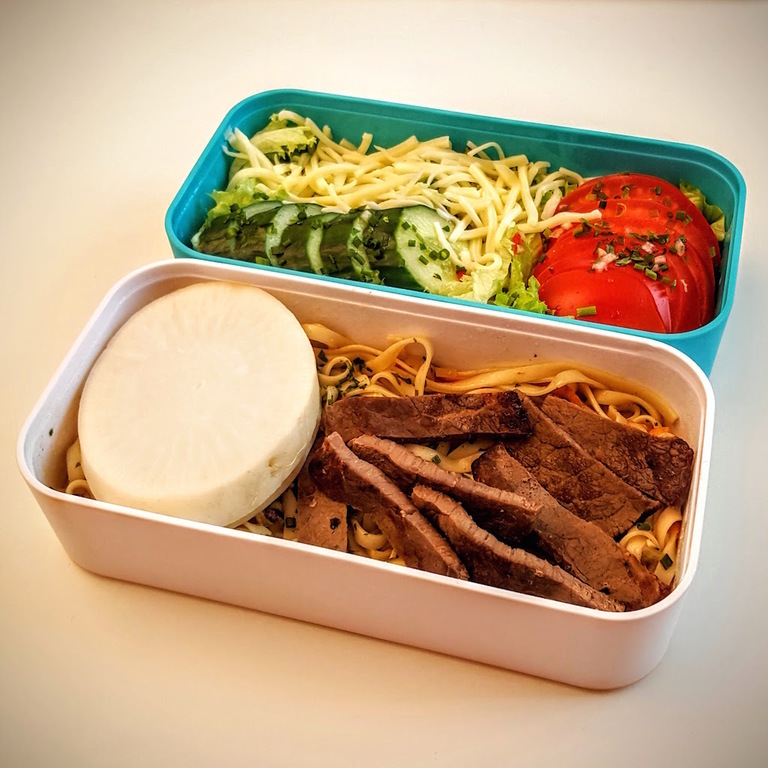 When everything is mixed, kill the heat, pour 1 teaspoon of olive oil over the pasta, stir and place in your bento container. You can sprinkle it with herbs, sesame seeds or dried onion! 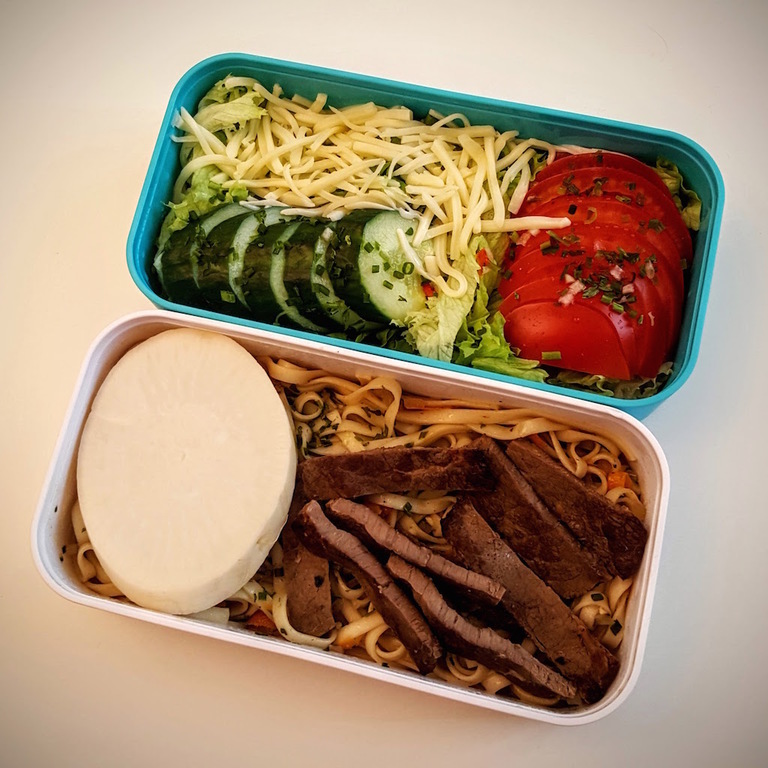 When the bento container is filled with aromatic pasta, place the beef strips on top and let the pasta cool a bit before you close your container. Never steaming-hot bento containers, because the vapor will ruin aroma and consistency, but also can help spoiling the food. You can add extra ingredients to your bento, e.g. pickled vegetables, cornichons, white (daikon) raddish. Savory or spicy vegetables will go nicely with the mild and semi-sweet taste of the beef and pasta!